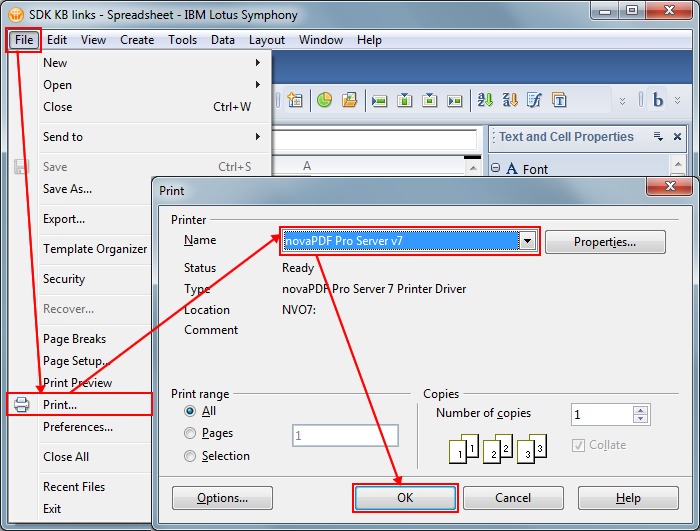 This tutorial shows how to convert an ods file format to a pdf by using the novaPDF printer driver along with some popular spreadsheet applications that have support for opening the format. If you do not have novaPDF installed, use our Download page to download and install it on your computer. The LibreOffice Calc application is a rather new one and it is basically a modified and enhanced OpenOffice Calc version with all the extra features and none of the drawbacks imposed by Oracle at first after taking over sponsorship of the OpenOffice project. The ODS file format is the OpenOffice/LibreOffice spreadsheet alternative to the Microsoft Excel application from the MS Office. The document is an open format created and developed originally by Oracle. The open format allows the users to further enhance and modify the ODS files without any limits. Several Office applications can open and edit the ODS file type but the native one designed to do it is the LibreOffice Calc. As the other open document formats are, ODS is based on the OASIS OpenDocument XML-based standard and supports a number of very useful features for both newcomers to the project and also advanced users deeply involved in the numbers and professional data processing. To be able to open and edit a ODS file you will need an OpenDocument compliant software, usually an Office Suite as most of the available ones can process the format. Despite the open source availability and the cross platform support, ODS files can become hard to deal with if large amount of data is processed and the files need to be viewed on mobile devices for example of to be sent on the fly to other people from either the same project or other organizations that may not have an application installed to be able to view the file. PDF documents do not have this problem as most of the mobile devices have PDF support for viewing and the portability is assured. Also pdf creators line novaPDF for example can add security to the PDF for sensitive data, can add signatures to the PDF file, can create searchable documents and more. To convert the ODS file to a PDF from LibreOffice Calc, open the application, then search for the file you want to convert by clicking on File->Open or pressing Ctrl+O. After that click File->Print or press Ctrl+P and in the Print window select novaPDF from the list of printers. Then click on Print and when the Save PDF File As dialog appears, setup any after save actions if you choose to and click OK. The conversion will be started. 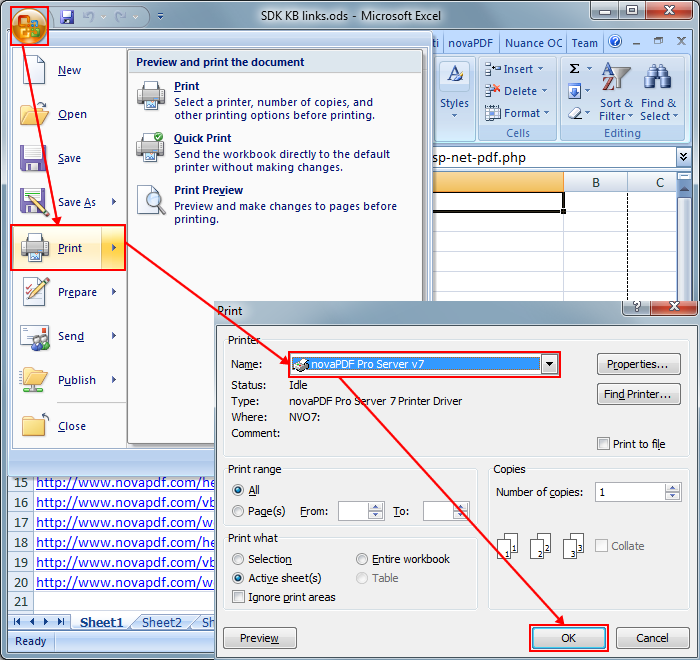 To use Microsoft Excel to open and print a ods file to a PDF one, browse for the file from the Excell application by using the Office Button->Open sequence or pressing Ctrl+O. After you have loaded the file, press Ctrl+P or click Office Button->Print and from the Print window choose as the printer name the novaPDF driver. Now click OK then OK one more time in the Save PDF File As window and the printing will begin. 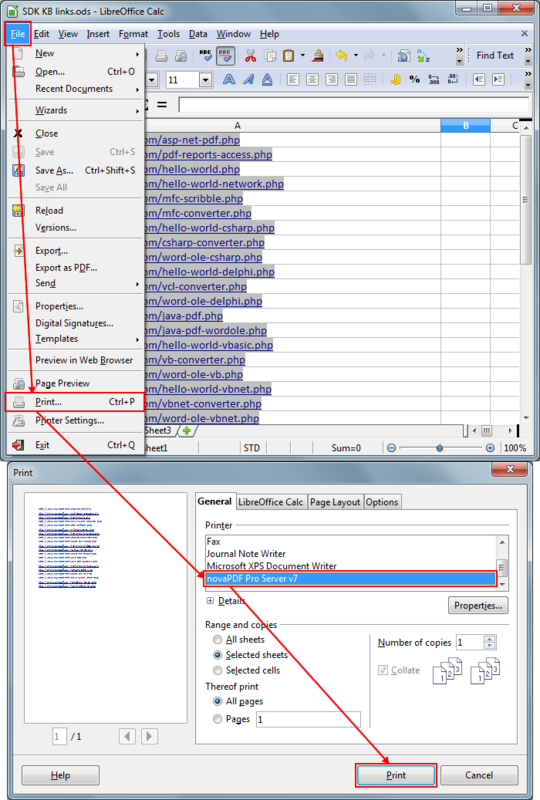 In Lotus Notes, open the ods file by either clicking on the Open button or pressing Ctrl+O. After that click on File->Print or press Ctrl+P and in the Print window select novaPDF as the PDF converter. Click OK and OK again after making changes to the after save actions if you need to and the ODS will be converted to PDF.